We are in the midst of National Pollinator Week (June 15–21)! An unprecedented group of twenty-four conservation and gardening organizations has formed the National Pollinator Garden Network and, with First Lady Michelle Obama, launched the Million Pollinator Garden Challenge. The Network challenges the nation’s gardeners to create one million additional pollinator gardens by the end of 2016. This campaign encourages home gardeners to help reverse the decline of honeybees and native bees, butterflies, hummingbirds and other pollinators. This extraordinary initiative underlines the importance of pollinators to our food supply and invites home gardeners to take effective personal action even as the nation’s Pollinator Task Force mobilizes more than fifteen federal agencies to improve pollinator health. Reduce or eliminate the impact of pesticides. Conserve all of our resources; use less and reduce your impact. Once you establish your pollinator habitat garden, visit share.pollinator.org/ to register your garden on the Pollinator Partnership’s SHARE site. Adding your garden to the site’s map of the United States gives you personal bragging rights as a friend to pollinators and supports the effort to encourage others to participate in the Million Pollinator Garden Challenge. The website for the Challenge (http://millionpollinatorgardens.org/) provides links to each of its members, and most (or all) of these groups identify pollinator-friendly plants. 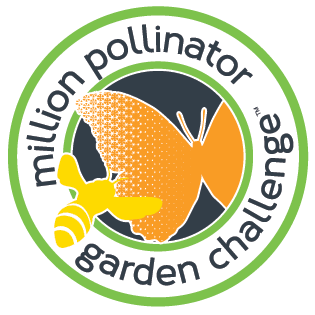 Join the Million Pollinator Garden Challenge. The bees and other pollinators will thank you, and your garden will be richer for the effort. This entry was posted in Essays 2015, Summer Quarter and tagged Bees, Butterflies, organic by tomkarwin. Bookmark the permalink.